In 1938, Mary Ford contacted the Walt Disney company about doing some of the creative work for its hallmark animated films. Presumably this meant work such as character designs, storyboarding, scenery work, etc. In order to become a Disney creative animator it was necessary for those interested to attend Disney's training school. It was extremely competitive and spots were limited. Unfortunately for Ms. Ford, she received a letter from a different department than the one to which she sent her original request for information. She was quite bluntly informed that creative positions were, "work...performed entirely by young men. For this reason girls are not considered for the training school." Womp-womp. But wait! There's more! 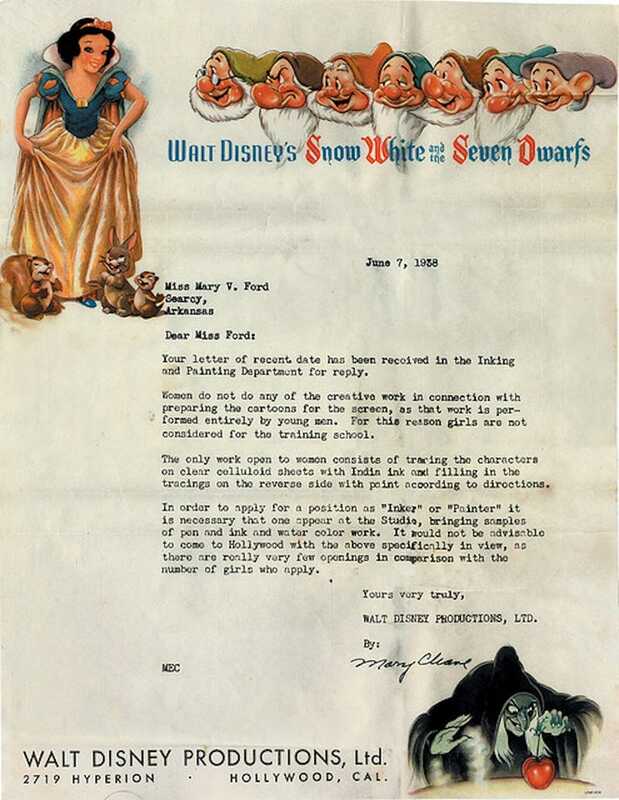 Not only were women (and note the problematic nature of calling young professional women "girls" but their male equals in age, "young men") barred from creative work and its training school, but honestly Ms. Ford, you shouldn't have even considered applying for the few spots Disney allowed women to have in 1938, "inker" and "painter" because even if you did get an interview, "it would not be advisable to come to Hollywood with the above specifically in view, as there are really few openings in comparison with the number of girls who apply." Sorry, Ms. Ford, you and your lady art skills needn't have applied. From Kevin Burg, grandson of Mary V. Ford.